Sign up on your phone in minutes with off-the-rack sizes and a picture or send us a well-fitting shirt you already have. You can also email us your existing measurements. 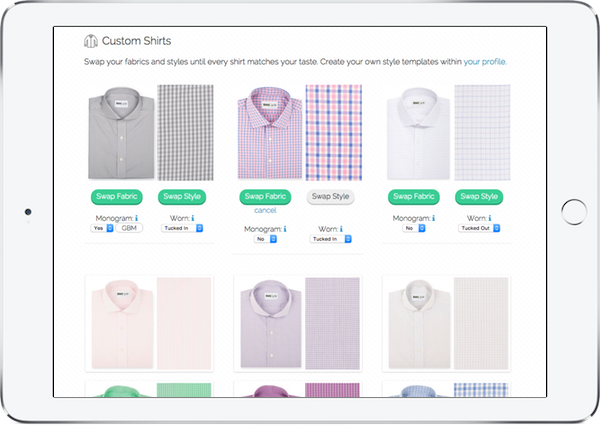 We verify your fit with a free custom shirt. Select white or blue. Your box includes a return label in case alterations are needed, which we personally handle. Alterations and shipping are free. 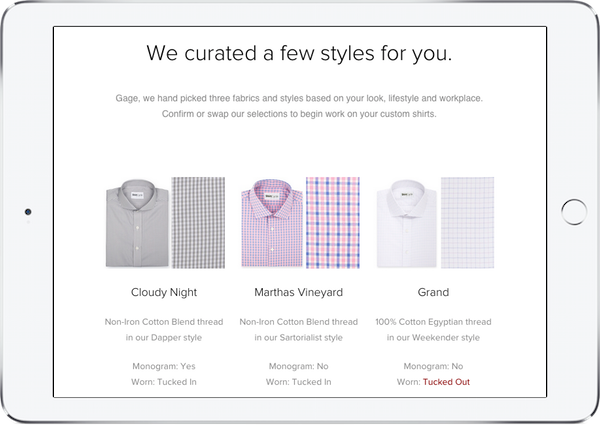 Preview your curated shirts online. Confirm your selection or swap fabrics and styles. We hand pick three fabrics and styles based on your look, lifestyle and workplace. You can swap your shirt fabrics and styles until each of them match your taste, including the monogram and cut. Your shirts arrive in three weeks. You only receive shirts in a fit, fabric and style you want. No surprises. Your shirts are hand made and cut to your exact measurements. Going forward, we'll curate new styles every other month. You can request or skip a box at any time. You’re never locked into receiving shirts you don't need. As your personal stylist, we track your satisfaction with the styles we select and note any styles you swap in order to improve our selections over time.